Chelsea boss Maurizio Sarri could have two difficult decisions on his hands as speculation has linked duo Cesc Fabregas and Gary Cahill with exits. The Blues have started the season well as they remain in the hunt for the Europa League and League Cup, while sitting joint top of the Premier League table. 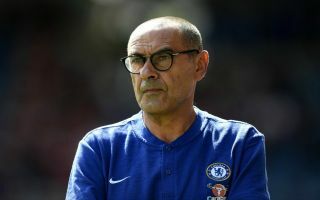 As the season progresses, Sarri will need to call upon the quality depth at his disposal to continue to compete on multiple fronts, but there could be important decisions to make in January and next summer. As reported by The Mirror, Atletico Madrid want Fabregas and considering he’s been limited to just three appearances so far this season, albeit injury has played a major part in that too, it could be a move that suits all parties concerned. The 31-year-old has undoubtedly fallen down the pecking order behind summer arrivals Jorginho and Mateo Kovacic, and particularly given he’s on an expiring contract, an exit from Stamford Bridge might be the most sensible outcome unless Sarri can guarantee him a more prominent role moving forward. It’s been equally as difficult for defensive stalwart Cahill, who has also managed just three appearances in all competitions so far this season as he too sits behind the likes of Antonio Rudiger and David Luiz in the pecking order under the Italian tactician. As per The Mirror, the 32-year-old is said to be a target for West Ham United in January, and so it remains to be seen if he pushes for an exit to secure regular playing time elsewhere. Ultimately, Sarri hasn’t needed the pair for the most part to get his side into their current position. Nevertheless, in the event of injuries, suspensions and loss of form, they could prove to be crucial as the year goes on and so it might not be the wisest idea to axe either of them in January. Perhaps if he has a summer transfer window to continue to stamp his mark on the squad, then Chelsea may well be in a position to offload those deemed surplus to requirements.